On Wednesday, October 18th, one of my lifelong dreams will come true: I’ll be a contestant on Jeopardy! It takes several steps to get onto the show: first, you must pass an online exam, but you don’t really learn the results unless you make it to the next stage: the invitation to audition. This step is completed in person, comprising a timed, written test, playing a mock game with other aspiring players in front of a few dozen other auditionees, and chatting amiably in a brief interview, all while being filmed. If you make it through this gauntlet, you go into “the pool”, where you remain eligible for a call to be on the show for up to 18 months. Over the course of one year of testing and eligibility, around 30,000 people take the first test, around 1500 to 1600 people audition in person, and around 400 make it onto the show each season. For me, the timeline was relatively quick. I tested online in October 2016, auditioned in January 2017, and thanks to my SoCal address, I ended up as a local alternate in February. Through luck of the draw, I was the leftover contestant that day. I didn’t tape then, but was asked back directly to the show for the August 3rd recording session, which airs from October 16th to October 20th. The call is early – 7:30am – and the day’s twelve potential contestants take turns with makeup artists while the production team covers paperwork, runs through those interview stories one-on-one, and pumps up the contestants to have a good time. Once you’re in, you’re sequestered. There’s no visiting with family or friends who accompanied you to the taping and no cellphones or internet access allowed. You do have time to chat with your fellow contestants, who are all whip smart, funny, and generally just as excited as you are to get to be on this show. There’s also no time to be nervous or worried: you roll through the briefing onto the stage for a quick run-down on how the podiums work (watch your elbows for the automated dividers that come up for Final Jeopardy! ), how to buzz in properly (there’s a light around the big game board that you don’t see at home that tells you when you can ring in safely), and under no circumstances are you to write on the screen with ANYTHING but that stylus! Next, it’s time for your Hometown Howdy, the commercial blurb that airs on the local TV station for your home media market. Since I’d done it before when I almost-but-not-quite made it on the air in February, I knew they were looking for maximum cheese. My friends and family tell me that I definitely delivered. Immediately before they let in the live studio audience for seating, contestants run through two quick dress rehearsal games to get out any final nerves, test the equipment for the stage crew, and practice standing on the risers behind the podiums without falling off. Then it’s back to the dressing room, where the first group is drawn. They get a touch-up on makeup, the rest of the contestant group sits down in a special section of the audience, and it’s off to the races! There are three games filmed before the lunch break, then the final two are filmed. The contestants have the option to stay and watch the rest of the day if they’re defeated, but most choose to leave if it’s later on in the filming cycle. The adrenaline crash is pretty huge, and some people may need the space to let out their mixed feelings. If you win, you are whisked back to the dressing room for a quick change, a touch-up again, and back out to the champion’s podium to play again. You may be asking, when do contestants meet Alex? Well, it happens exactly twice, and both times, the interactions are entirely on film and broadcast in (nearly) their entirety within the show. To put all of those collusion rumors around the recent streak of Austin Rogers to rest, the interview halfway through the first round and the hand-shaking at the end of the game are the only times that Alex and the contestants meet or speak with one another; there is no “backstage” where the answer-giver and the question-providers could possibly mingle. Nor do the contestants ever get to do more than wave “hello” to the writers for the show. Jeopardy! is very careful to keep its two halves very separated. 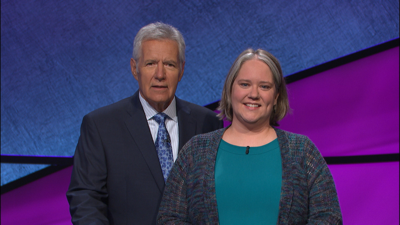 The energy and enthusiasm of the contestant team – Glenn, Maggie, Corina, Lori, and Ryan – is genuine, and when your appearance is complete, you feel as though you have joined a very special family of Jeopardy! alumni. Once you’ve been a contestant on Jeopardy!, you can never be on the show again. The only exception is if you do well enough to be asked back to the Tournament of Champions. While gag rules prohibit me from saying more about how I did, I can say that the entire experience lived up to the hype I had built around it since I was a child, playing along in my living room and dreaming of the chance to respond in the form of a question.